Question of the Week: Great Movies of 2014? | J.W. Wartick -"Always Have a Reason"
Question of the Week: Great Movies of 2014? I realized recently that I haven’t been to as many movies this year as I went to last year. However, it does seem that the movies I have gone to see have been awesome. Early in the year I saw the appropriately-timed Frozen, which I felt had some great themes in it to go with its fantastic music. Then, I went with a friend to see “Lone Survivor,” which I am pleased to report showed greater complexity than many war movies or commentary on the war in Iraq. Then, I saw “Captain America: The Winter Soldier,” which may have been the greatest superhero movie other than the Dark Knight trilogy. I loved its moral commentary. Finally, I went to go see “Edge of Tomorrow” and “X-Men: Days of Future Past” back-to-back last weekend. The X-Men flick was fantastic and brought up, again, questions of morality. 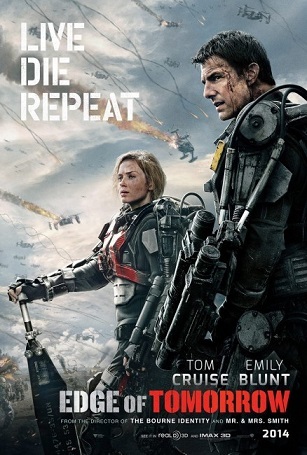 “Edge of Tomorrow,” I would say, is my favorite movie of the pack so far. It was just so good and it helps that it was a genuine sci-fi epic. “Edge of Tomorrow” brings up a number of topics like sacrifice and choice which aren’t always explored in movies, let alone blockbuster action flicks. This post was adapted from my “other interests” site, which you may want to check out- Eclectic Theist. « Really Recommend Posts 6/27/14- Bible Literacy Quiz, YA Lit, and more! Edge of Tomorrow was a welcomed fresh air from the continous bombardment of sequels and re-packaging of comic book characters. I was pleasently surprise as to how much I like it…it also raises some questions about pre-destination and free will. X-men was also very entertaining with a heavy moral component to it. That I liked. However, have you seen How to Train Your Dragon 2? It was really good. The family theme that develops in the movie was great. It has one of the best scenes about family unity that I ever seen on the big screen. Thanks for the recommendation! I’ve had many people suggest How to Train your Dragon 2. I have not, however, seen the first one and I feel like I probably should before i see the sequel. Any thoughts on that? Yes, I think you should see HTYD before you watch the sequel. A lot of the plot point relied on the foundation lay by the first movie. I did! Thanks for the heads up! What a great review, thank you for posting. I think it is great to find movies with great Christians themes in them. I am so glad that you like them! I was wondering if you have ever seen any movie by the Duardane brothers? They are Belgian filmmakers that make amazing independent films. My favorites are: The Son (Great treatment of forgiveness) and The Kid with a bike (Great treatment about the effect of abandonment). The Lego movie was fantastic. I’m in line to get that one from the library! I’m very excited because I have only heard good things.